Now that the weather is cold I’m back to baking bread! There really is nothing better than the smell of bread on cold Sunday afternoon. I’ve been attempting to tweak my favorite bread recipe to increase the flavor and texture and I’ve come up with these three bread baking tips that I think dramatically improved the quality of my bread. I have a couple of different bread recipes that I use as my fall backs, and all of them benefit in flavor by allowing the dough to rise in a cool place for a longer period of time. The NY Times no-knead bread recipe is the prime example of how a long rise can add immense flavor. The long rise allows the yeast to develop into a complex combination of smells and flavors. The cold temperature slows down the yeast’s digestion of the sugars in the flour, again creating more complex flavors. I often let the dough rise for a few hours and then place the dough (covered in a bowl) in the refrigerator to continue to rise. The next day remove the dough from the refrigerator and allow it to come to room temperature before shaping it for the final rise. Finally, to add even more flavor, I sometimes replace the bread flour with small amounts of whole wheat flour….about 1/4 cup. The whole wheat adds a nutty richness to the flavor of the bread. Baking in a covered cast iron dutch oven has many advantages to baking directly in the oven or on an oven stone. To create a thick, crunchy crust the loaf needs to have steam in the beginning of the baking. The hot temperature allows the inside of the bread bake while the steam insures the outside of the bread (the crust) doesn’t over-bake. After the first half of baking is complete, the steam must be released to allow the crust to harden. Professional baking ovens have built in steamers that inject and remove steam whenever necessary, but regular ol’ home ovens usually don’t have this feature. Baking in a covered dutch oven (or Le Creuset if you’re lucky! )traps the steam created from the water in the dough and also creates an extremely hot surrounding. To bake in a dutch oven, simply pre-heat the oven with the dutch oven inside of it for a minimum of 45 minutes. When ready to bake, remove the cover from the dutch oven and carefully drop the dough inside of it. Replace the cover and bake for half the baking time at which point you will remove the cover (allowing the steam to escape)and continue baking for the remainder of the recommended time. If you don’t have a cast iron dutch oven a pyrex round container with a cover will also work. I always bake my bread for the first 10 minutes at 500 degrees regardless of what the recipe states. This insures that the crust blisters and sets. After the 10 minutes I lower the temperature to the recommend one and continue to bake. I also usually over bake for about 15 minutes. The longer baking time ensures that the crust turns a rich caramel brown which means that the crust has successfully baked. 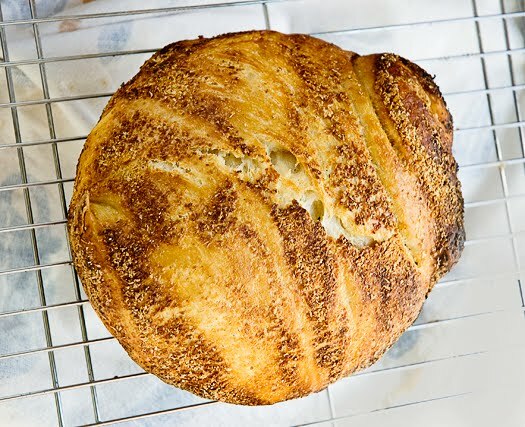 A light brown crust will not be flaky and crunchy, but rather soft and chewy…nothing wrong with soft and chewy, but a classic artisan hearth loaf has a crunchy crust, and this tends to be the hardest thing to re-create in a home kitchen. So those are my three tips. They’ve worked for me and hopefully they will work for you. Do any of you have any bread baking tips to share? Good tips, thank you I'll remember them next time I make my no knead bread. Most excellent tips! I'll try them all next time around.